Good morning, everyone! Hope you all had a wonderful week! 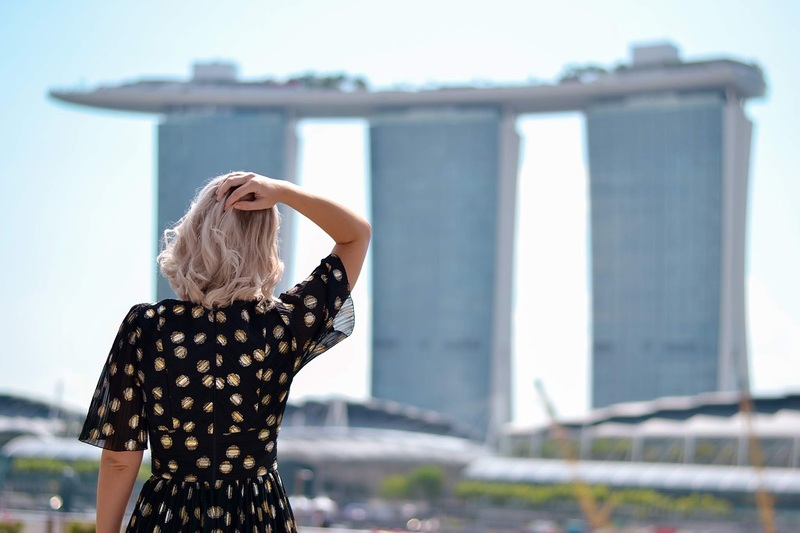 Every once in a while, and I'm sure you've all been there, you come across an item so wonderful, that no matter how many times you wear it or even what you wear it with really, somehow it makes every outfit feel a little more special. Well, for me it's the skirt I'm wearing in today's post. I've had it for a few years now and wore it on numerous occasions, from formal dinners to casual strolls and to this day, it never failed once to put a smile on my face. Don't really know exactly what it is about it, that makes me feel this way. Perhaps, it's the color, or the volume, or the front pleat or, what is most likely, it is the combination of all those elements. In short, I am head-over-heels and obsessed about it. Just because it's freezing cold outside doesn't mean you have to hide all of your dresses away until the temperature goes up a little bit. Dresses can be worn even in the middle of the winter and all it takes to make them cozy enough is a little bit of layering knowledge. In fact, you should wear your dresses in the winter. They have the potential to look really adorable and stylish! 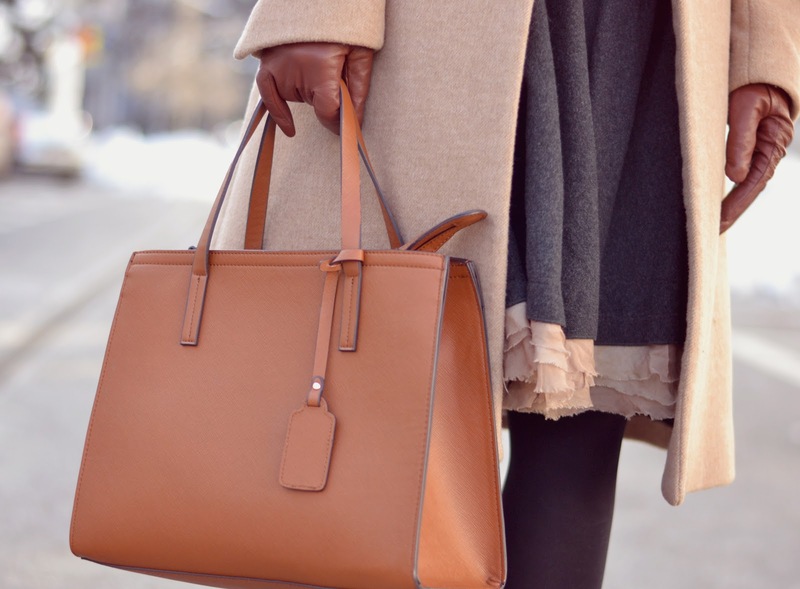 In order to make dresses appropiate for winter, you have to have some fashion basics: leggings, tights, boots, thick socks, cardigans and scarves. You want to look cute, but you also don't want to freeze off. It's not worth it. 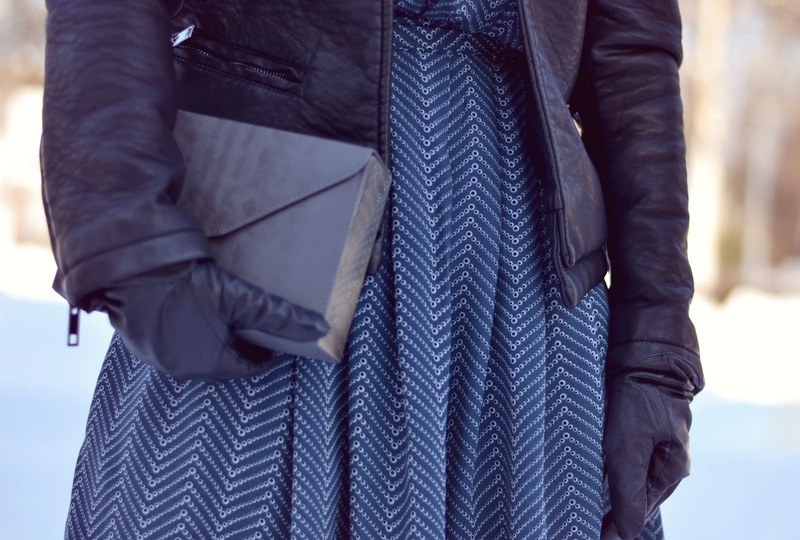 Pair your dress with a leather jacket, black tights and black booties. Soft, opaque tights can give you the warmth and coverage you need when wearing a skirt or a dress. Instead of being the star of the show, make your dress part of an expertly layerd look by adding a cool jacket. 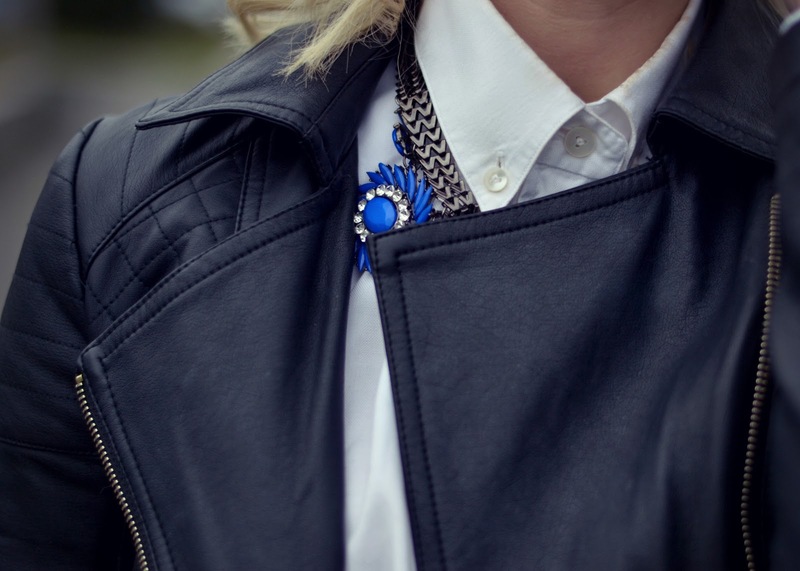 A biker leather jacket works best in this case and feel free to play with color and prints! "The word poncho is derived from Spanish and is an outer garment designed to keep the body warm. Ponchos have been used by the Native American people of Andes pre-Hispanic times and now are considered typical South American garments"
A poncho scarf is a chic, modern and versatile piece to add warmth and style to every look. The poncho scarf is the ideal layering piece- layer over everything from chunky knits to bodycon dresses and over denim or leather jackets to tailored separates. The truth is there is something so incredibly cozy about them, yet still very chic and dressed up! And of course, you know how much I love that. I am also digging a simpler almost monochromatic color palette these days, opting for just a single pop of color or print. Today's hero piece is this gorgeous blanket coverup. Because it's such a statement piece I decided to pair it with simple black items. I also loved adding a pop of silver to my black and white look, so I opted for a pair of mirrored sunnies. This elegant cover-up can be worn over the shoulders for a nonchalant twist, draped for a contemporary look or with belt at waist to show your feminine silhouette. Make a fashion statement with printed ponchos! Can I confess something? I feel like I can. Here goes: I'm addicted to plaid scarves. 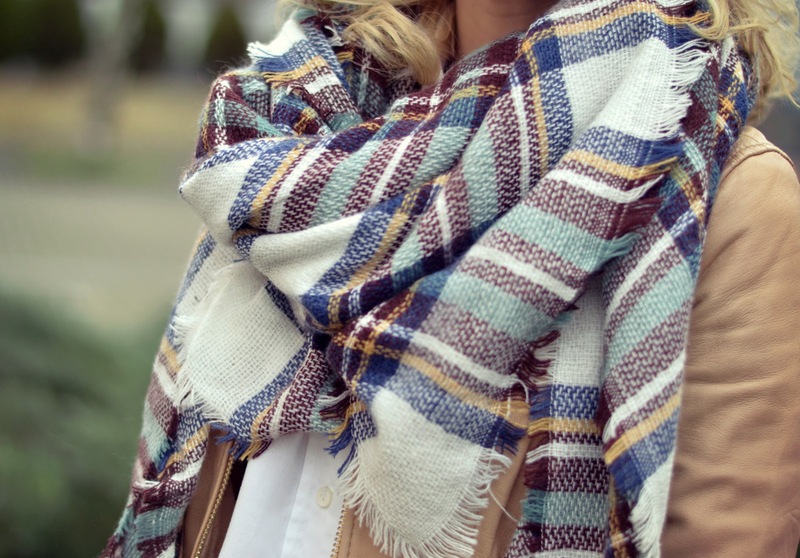 I love plaid anything, I'm obsessed with scarves and when they come together I just go crazy. Blanket scarves, infinity scares and cozy knit versions in every shade imaginable. Do I have the time to wear all of them? I don't know. Do I need three different versions of the same plaid scarf because one is more mahogany red than classic red and one has fringe while the other doesn't? No, I really don't. But this logic doesn't help. Plaid scarves are fall and winter essential and I know I'm not the only one who hoards them in this way. The first best thing about a plaid scarf is that it's cozy and keeps you warm. The second is that you can literally wear it with anything. Leather jackets are great for fall, but on winter chilly days they might not help that much. 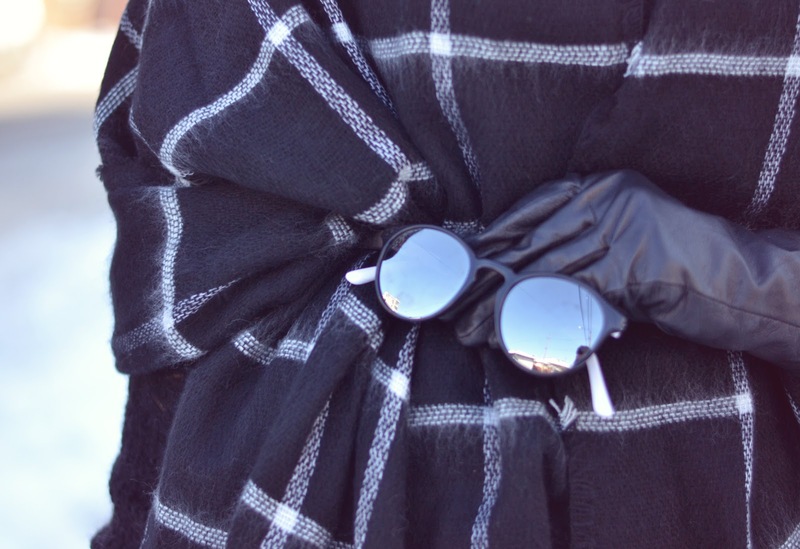 A scarf keeps you warm-plus, there's something about plaid and leather that just look so good together. Try matching one of the colors in the scarf to your shoes and you'll make even a simple outfit like this one look instantly more interesting. 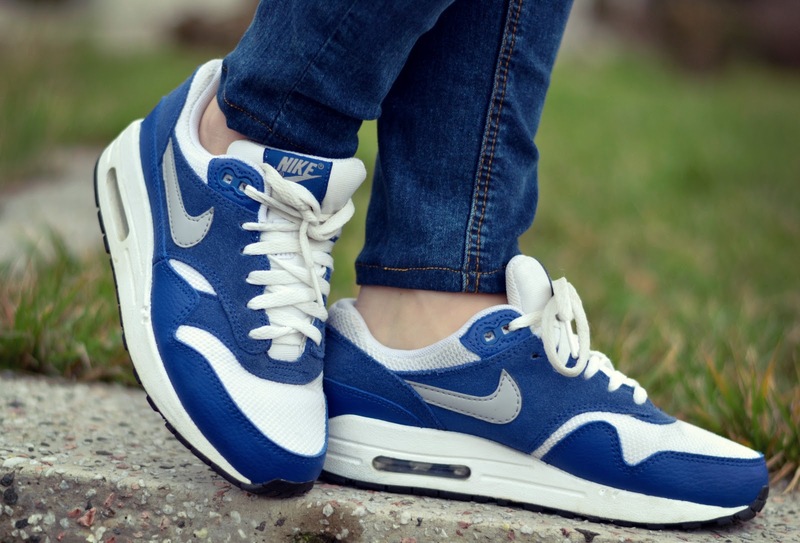 Until a few years ago, sneakers were considered just sport shoes. However, recently, as we notice in the street style and not only there, they have become super hyped. Maybe it's because they're extremely comfortable or maybe it's the fact many designers started offering them in their collections. Dressing down when others are dressing up is the easiest way to look super-stylish. And it seems that everyone has caught on, whether they know it or not. Style has become something wholly new and even fashion-forward. It's a brave new world out there, and how better to navigate it than in shoes you can actually walk in? But switching the way you think about sneakers takes time, and figuring out when and how to wear them can be tricky. Looking for my Nike Air Max shoes was one hell of a job. I've literally visited ALL sneakers stores (no joke) and searched everywhere online. But finally, during our trip in Barcelona, there it was, my dream pair in my size. It wasn't my first choice of color (as I was looking for all white ones), but it had something that convinced me though. I have told you yesterday I will show you three different ways to style a leather jacket and a pair of jeans. This is the second outfit. A little bit edgy and sporty. What do you think? Do you like it?